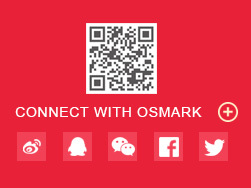 Osmark is located at National University Science Park of Wenzhou City, Zhejiang Province. We are a national high-tech enterprise which is dedicated to the R&D 、Production、sales of oxygen sensor. Since 2006, we have developed the core component of oxygen sensor for motor vehicles. After ten years of development, we have established a complete original samples database, which provides important data support for product development and ensures that the oxygen sensor matches the vehicle one by one. So far, our products have covered Thimble oxygen sensor, Planar oxygen sensor, Wide-band oxygen sensor, and A/F rate oxygen sensor, in a total of more than 1,800 models, to meet market and America, European, the Middle East and so on. We have mastered the full core components manufacturing technology of oxygen sensor and have obtained more than 10 patents. Owning the independent design and development capabilities of oxygen sensors, we can also develop products according to customer’s samples and requirement. Our company currently has the whole-process manufacturing equipment for oxygen sensor, such as: plasma spraying equipment, cold isostatic press machine, automatic coating equipment, casting machine, warm isostatic press , precision control high-temperature furnace, automatic precision screen printer, precision ceramic slicer, and automated test equipment, etc. In 2014, we have successfully developed the core component of wide-band oxygen sensor and A/F rate sensor which this technology is leading in the country. In 2016, manufacturing technology of wide-band oxygen sensor of project was listed as a major science and technology project in Wenzhou City. Our excellent team has accumulated over 10 years of experiences in R&D and manufacturing of oxygen sensors. Our staff which have completed college education account for more than 30% of total, while the R&D personnel account for 20%.Healthy corporation culture and excellent technical team, for the long-term development of our business has laid a solid foundation. We have passed IATF 16949, Our company adheres to the quality policy of “To do a good job in every details, to improve customer satisfaction”, integrating "Craftsman Spirit" into our corporate culture. Through perseverance and excellence, we constantly strive for realizing our own values and creating more values for customers.